The hike takes you to an area that has been mostly deserted from the early seventies, so abandoned farms and ancient farmsteads set their mark on the surroundings. You probably won‘t meet anyone. Except perhaps sheep - and elves. This is their land. But they´re willing to share. 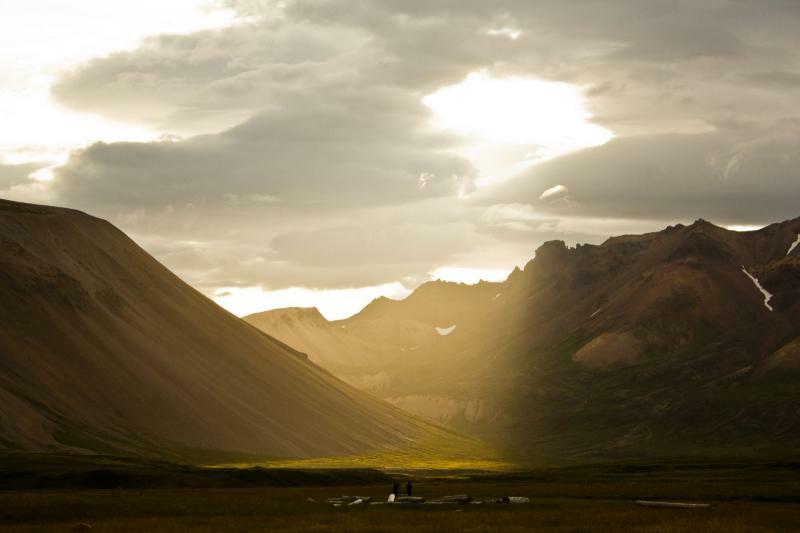 The mountains are glorious and they come in all shapes, sizes and colors. Pink, brown, yellow, green, brown. Not to mention the moss, ranging from bright neon green to pale gray. 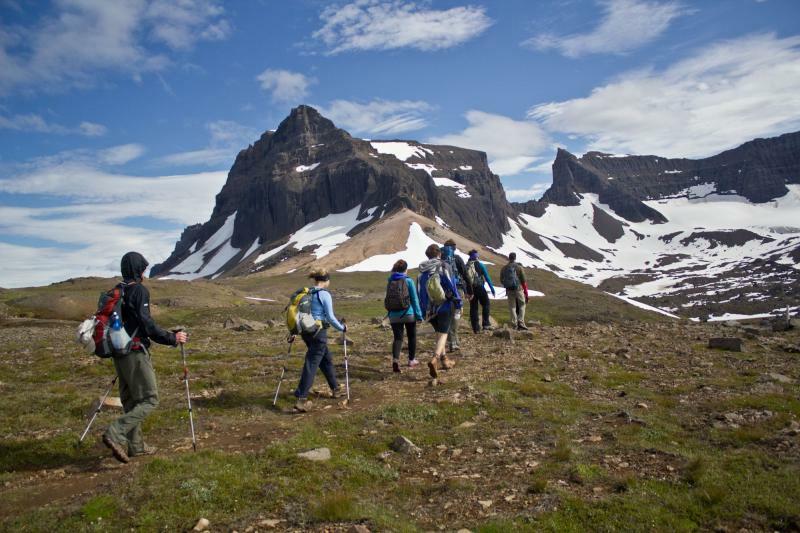 You will follow rails that lead you through lush valleys, up and around the beautiful mountains, across brooks and rivers and along deep fjords. 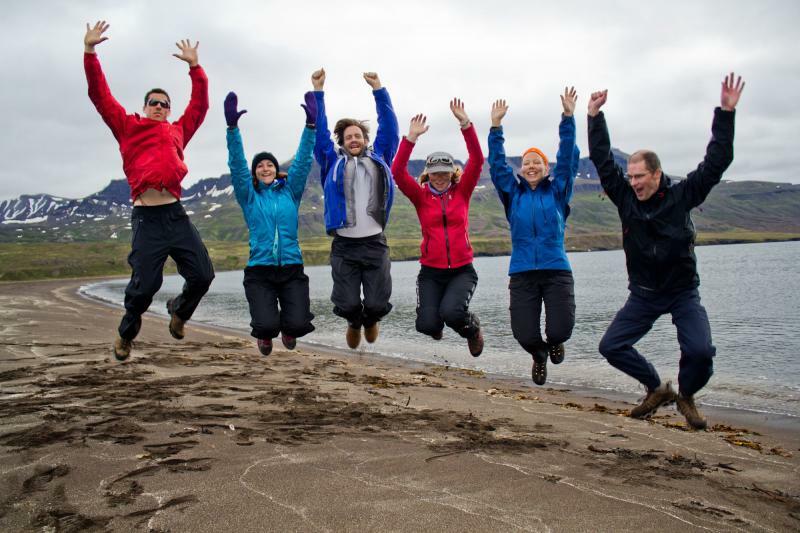 Go to the Information Center at the Campsite in Egilsstaðir, where you will catch the „Post truck“ bus to Borgarfjörður Eystri at 12 noon. The bus drops you off at the bottom of the pass of Vatnsskarð and you follow the old sheep trail leading through the green foothills of the Dyrfjöll peaks. As you round a small hill these impressive peaks come to view and your hike continues towards these peaks and the impressive gap between them. Right in front of the gap lies the Stórurð, the place you are headed for, a magical place with huge boulders and milky blue ponds. 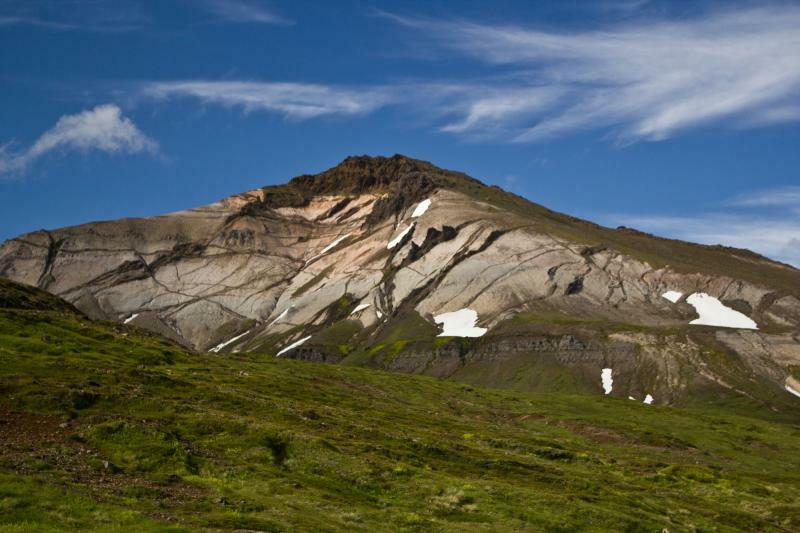 After walking the round in this amazing labyrynth you climb up the hill to the pass of Mjóadalsvarp, heading north along the Súlur hill and across the Geldingaskörð and Geldingur peak from where there is a great view to the north face of the Dyrfjöll peaks. At the pass of Vatnsskarð a vehicle awaits to pick you up and take you to the little village of Borgarfjörður. Accommodation in Borgarfjörður. Hiking time: 6-8 hours, uphill/downhill: 600 m/800 m., appr. 18 km. Today the path leads you over a pass and down into the inlet of Brúnavík. 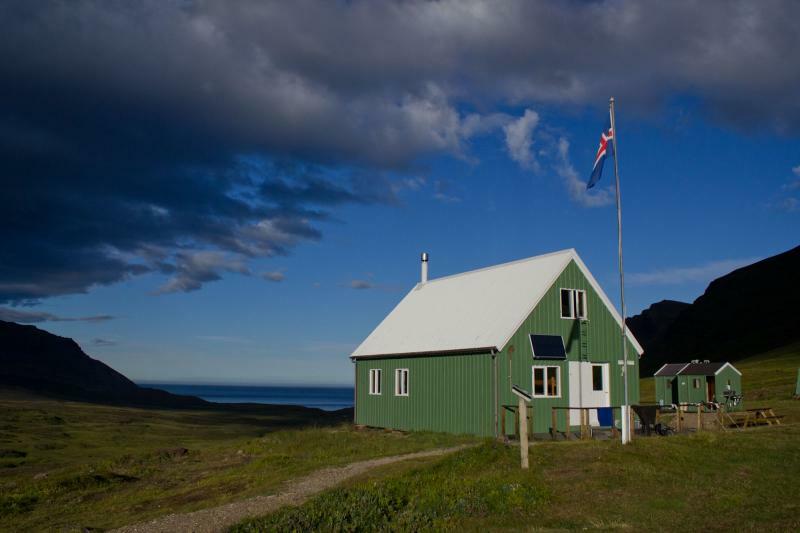 Here you can enjoy the waves of the North Atlantic for a while before heading up into the valley and over the magnificent pass of Súluskarð where the colors of the adjacent hills and mountain tops provide a colorful feast for the eyes. From Súluskarð you head down into Kjólsvík inlet and from there over the low pass of Kjólsvíkurvarp down into Breiðavík inlet, the biggest one of these deserted inlets. Accommodation in the hut in Breiðavík. Hiking time: 7-9 hours, uphill/downhill: 400 m/400 m., appr. 14 km. 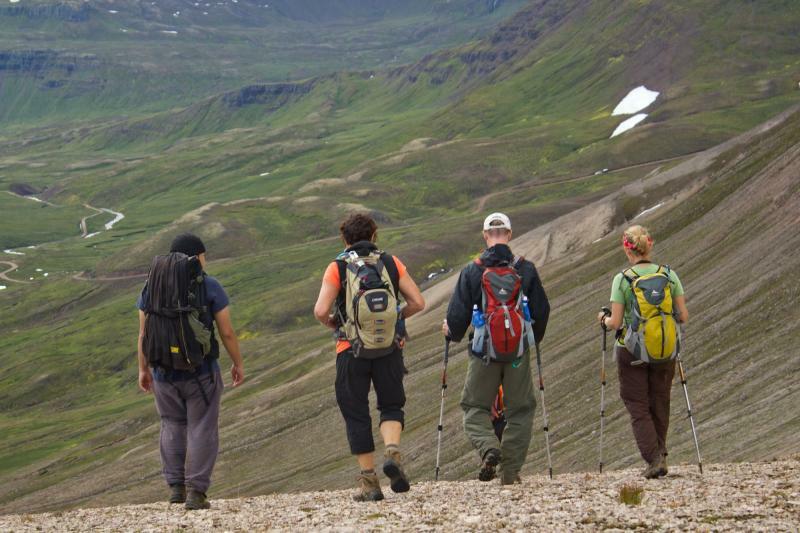 You leave the colorful valley of Breiðavík and hike over the mountains, today‘s destination the inlet of Húsavík. If weather permits you can climb the mountain Hvítserkur, one of the most amazing and colorful mountains of Iceland before descending into the narrow valley of Húsavík. A delightful evening walk down to the beach, to visit the quaint little church that was in full service until the early seventies is possible after dinner. Accommodation in the hut in Húsavík. Hiking time: 5-7 hours, uphill/downhill: 550 m/500 m., appr. 13 km. 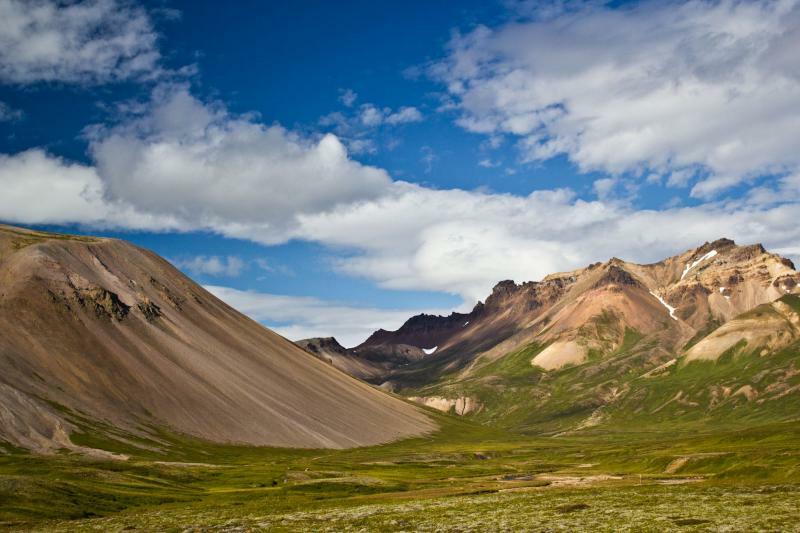 Today you continue to the valley of Loðmundarfjörður fiord. This impressive valley was home to close to a hundred people at the turn of the 20th century due to rich farmlands and accessible fishing grounds. 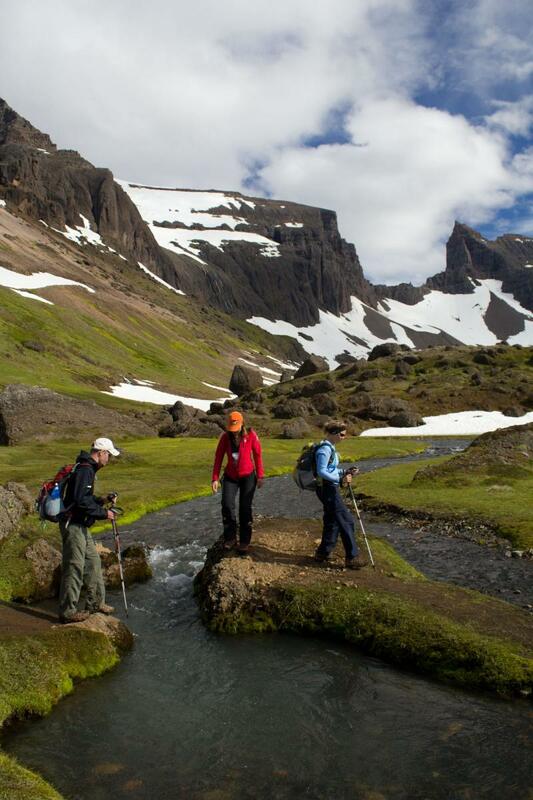 The surrounding mountains add certain magnificence to the scene and the hike leads you through the massive Loðmundarskriður, formed thousands of years ago when the adjacent mountain literally burst forth. The hut where you spend the night is at the bottom of the fjord close to an old church. Hiking time: 5-7 hours, uphill/downhill: 600 m/600 m., appr. 15 km. 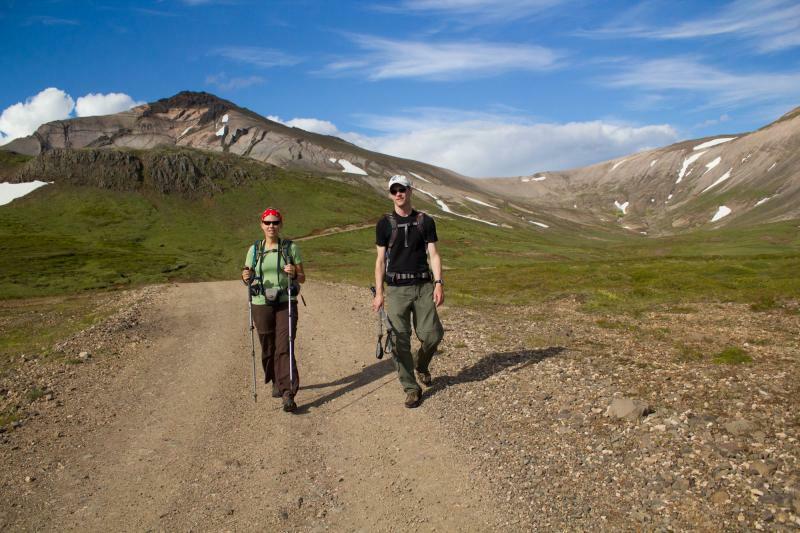 The last day of your hike takes you along the old path over Hjálmárdalsheiði, which, over the centuries used to be the main thoroughfare between the Loðmundarfjörður farmlands and the Seyðisfjörður harbor and trading post. As you ascend, the mountaintops of the southern fiords come into sight and once you get to the pass of Hall, the fiord of Seyðisfjörður is in full view, very different from the fiords and inlets you have now left behind. Descending into Seyðisfjörður, enjoy the breathtaking panoramas of this long and narrow fiord surrounded by majestic mountains. 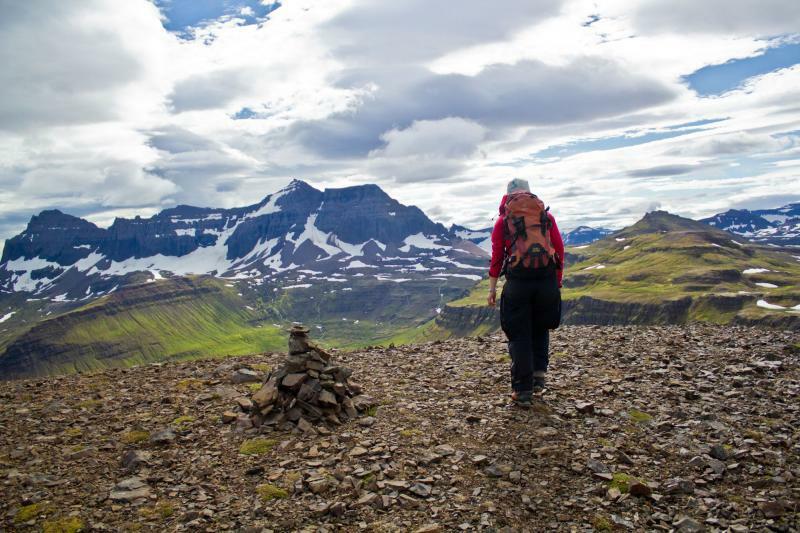 Once you get down to the main road you hike along it until you come to the town of Seyðisfjörður, where your accommodation awaits. Hiking time: 5-7 hours, uphill/downhill: 600 m/600 m., appr. 15 km. Today you take the bus from Seyðisfjörður to Egilsstaðir, where the tour ends.